It's been cloudy and not too hot here! It's ok to eat lasagne! Even though Andrew told me it was a winter/cold weather meal. I don't care what kind of weather is going on, I am always happier than happy to eat lasagne. For a long time, I didn't really care for it all that much. Especially if the ricotta was too granular and ooky. I can't really explain what makes ricotta taste ooky, but I think you'd know it if you ran into it. Please don't make me eat ooky lasagne, see also DRY. No dry lasagne! I don't really have a recipe to share exactly. I kind of do, but it's been culled together from a variety of sources over the years. I won't tell you what kind of meat sauce to use, except you should use at least 4 good cups of it or so, and it should be meat sauce. 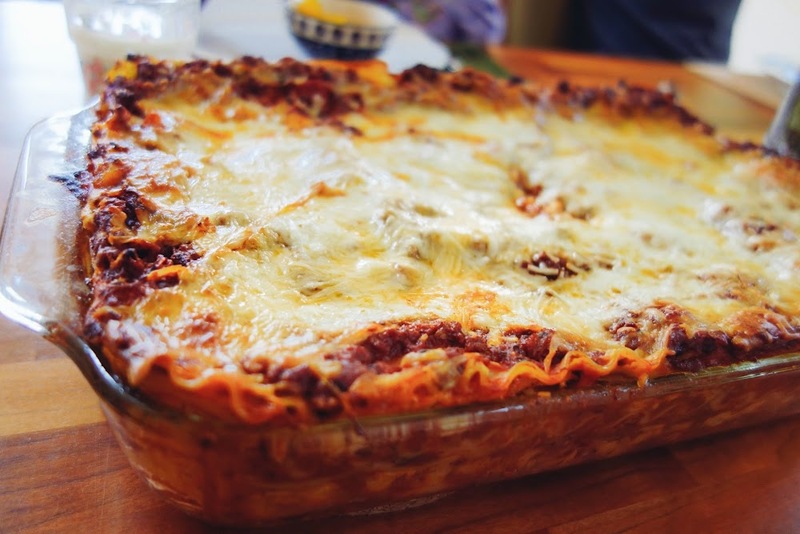 I won't judge or fight with you veggies out there, I would probably like your veggie lasagne absolutely a lot, but when I want some comforting lasagne, I want it with meat sauce BUT NO SAUSAGE. Italian sausage makes me burp these days, and it's too spicy for me. So what makes this a pantry meal? Nothing except I love the term 'pantry meal' and want to use it whenever I can, and I always always have half a box of lasagne in my pantry. Only this time I was making a full 9x13 pan of lasagne and I had to send Andrew to the store for more lasagne noodles. And the ricotta and basil and the cheeses. Friends? I've tried the no boil noodles, and for me, they are not awesome because they have no curly edges. I can't happily eat lasagne without the curly edges to the noodles. But if you are stressed for time, you can use them. If I have the time, I like the kind you boil first. If you have the sauce ready to go (I had a whole bunch of leftover spaghetti sauce in my freezer), that's more than half the battle with lasagne. The rest of it is just assembling. 1 box of lasagna noodles, although I didn't use all of it because my pan got filled up before all the noodles were used. Either make whatever sauce you like, or thaw it from the freezer, like I did. Totally not helpful that I'm not giving you a sauce recipe, but that's a recipe for another day. Boil the noodles according to package directions, in salted water with 1 T. olive oil in the water, so the noodles don't stick together. Drain and lay out flat on paper towels. Prepare ricotta filling. Empty the tub of ricotta into a food processor, along with a 1/2 teaspoon of salt, a few grinds of pepper, 2 whole eggs, 1/2 cup of Parmesan, 1/2 cup of mozzarella, and the shredded basil. Pulse/process until creamy looking and basil and egg are uniformly distributed. Spray nonstick cooking spray or smear some oil on the bottom of a 9x13 pan. I used a glass pan. Spread a half cup of sauce on the bottom of the pan. Begin layering. Noodles, ricotta, 1/2 cup mozzarella, 1/3 cup parmesan, cup of meat sauce. Yes your sauce will get kind of gloppy on top of the ricotta, that's ok. Repeat layering 3 more times. On top of the last noodle layer, (you should be out of ricotta filling at this point), spread the remaining sauce, and make a nice uniform layer of mozzarella and parmesan cheese, you can spread on a bit more than you did on the in-between layers. 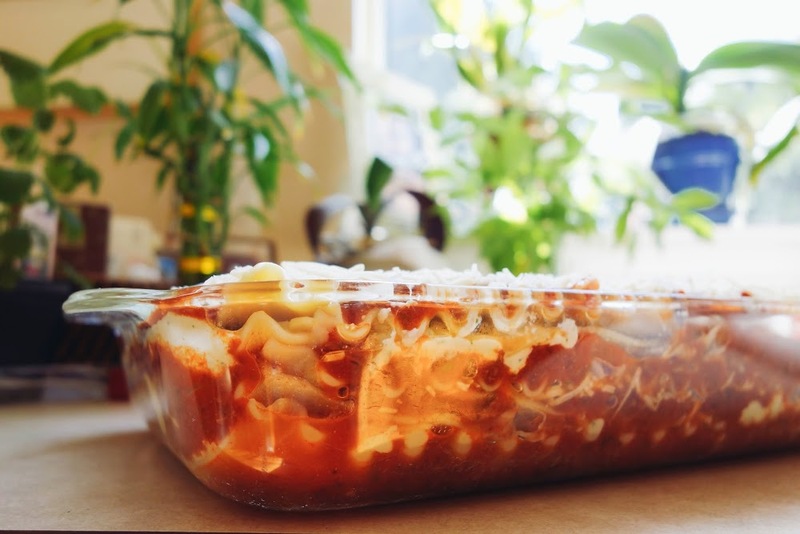 What's great about lasagna is that it's all pretty much up to you. Bake for about 35 minutes, covered with foil. Uncover and bake for another 15 minutes. 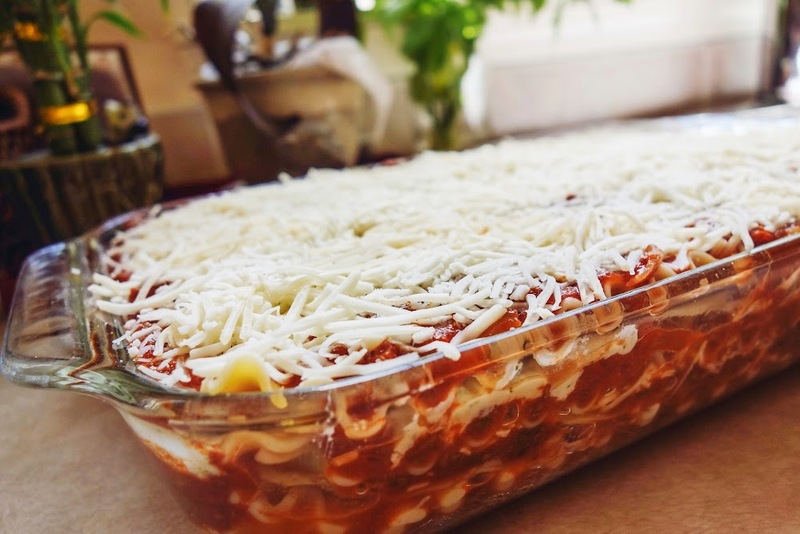 (if you have chilled the lasagne at all in the refrigerator, bake about 40-45 minutes initially, and then another 15-20 minutes uncovered. If you kept it in the fridge overnight, let it sit at room temp for 15 or so minutes before baking. I carefully poke my finger in the center to make sure it's not cold in the middle, but don't burn yourself and then get mad at me ok??). Let rest 5-10 minutes and then eat your lasagne. The entire recipe can be cut in half and baked in an 8 inch pan to feed four people. The full recipe will feed 8-10 people. I also find cold lasagne to be CRAZY delicious. 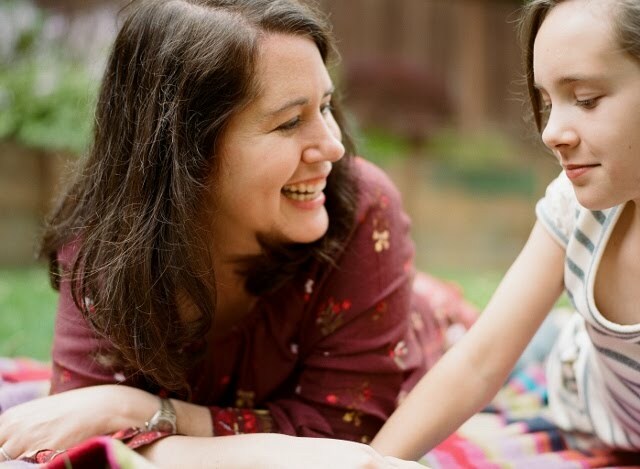 here's a funny thing -- my kiddo is not too keen on spaghetti, even with meatballs, but she LOVES lasagne! 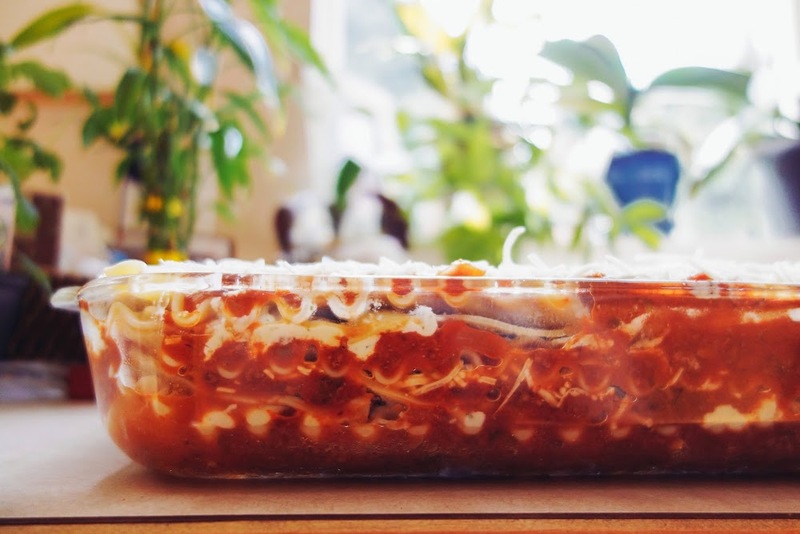 We should all have spaghetti sauce in our freezer and noodles in our cupboards - they should just teach that in school - then we could all call lasagna a pantry meal. Me? Well, I have neither =( so for me it is a "make sure it is on the menu so I buy the stuff" meal. Either way, it looks very yummy. ha ha ha, there you go! actually, if I were really on top of things (never) -- I'd make a giant pot of sauce every other month and keep it in the freezer. And then use it in lots of different things, DIY calzones, mini lasagnes, spaghetti, sauce base for meatballs (Andrew likes to eat meatballs just with sauce and bread, hold the noodles!). i wanna try with cottage cheese! that sounds yummy!! I make lasagne only once or twice a year, mostly because I don't want to be eating it for a month...why not freeze one Melissa? Why? b/c that would be too organized.